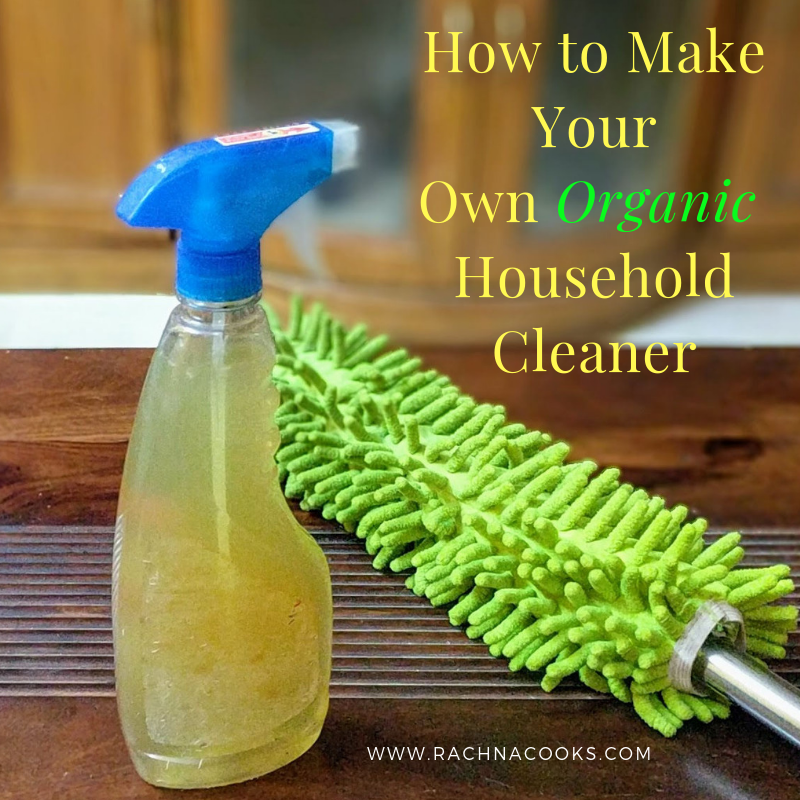 I had read about garbage enzyme or organic household cleaner and its amazing properties in one of the groups that I am a part of and was instantly motivated to make it at home. 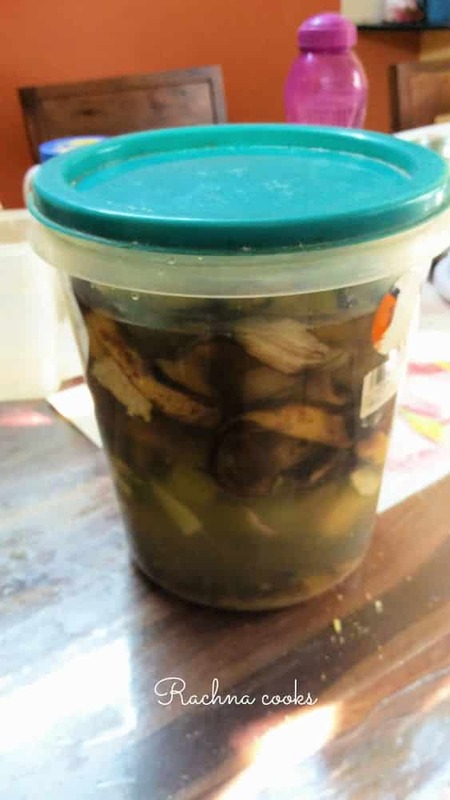 It is so very easy to make and in 90 days you have very own garbage enzyme as it is popularly known that you can put to multiple uses including but not limited to kitchen and household cleaner, pesticide and organic fertilizer for your plants, bathroom cleaner and more. I took a plastic can with a cover. Take jaggery and fruit peels in the ratio of 1:3. I used a combination of banana, papaya and citrus peels like orange and lemon. Using more citrus peels gives a nice citrusy aroma to your final enzyme which is like vinegar. You can make the same with vegetable peels as well. So now weigh your jaggery (you may use sugar as well) and fruit peels. Use 300 gms. of peels to 100 gm. of jaggery and add it to 1 litre of water. Maintain this proportion for larger batches. Keep it in a tight jar in a dry, dark corner. Open it everyday to release the gases that accumulate in the jar and then shut it tightly. Do it every day for the first two weeks. Subsequently once every 2-3 days and later even lesser. In 3 months your garbage enzyme is ready. This is how it looks when done. The colour will depend upon the colour of peels. Strain it and fill it in bottles to use. Dilute it before using and test it out in small batches to nail the right concentration. For heavy duty cleaning use this with baking soda. For cleaning and disinfecting glass, sinks, kitchen, toilet and taps. I am using it in place of my regular cleaner. It is pretty effective. For mopping floors: Use two capfuls in one small bucket of water for squeaky clean floors. In your toilet: Use it to get rid of mold, scales on your tap and in your cistern to clean your toilet and also clean the quality of water. For your plants: I have to start doing this. Diluted to 1000 parts, this can be used as an organic pesticide and fertilizer for plants. It is known to repel insects and promote plant growth. I am very excited to try this as pests are a big problem when you grown organic produce. Use it to clean your car. Use it to disinfect shoes and rooms by diluting it and spraying it. At the moment I am using it as all-purpose cleaner. Apparently you can use it to wash utensils but I didn’t find it soapy so perhaps adding it to your regular dishwash liquid can enhance its effectiveness especially the germicidal ability. I think I can use it with soapnut extract for an efficient cleaning solution. Haven’t tried it so far though. You can also use it as a hand wash. Again have not tried it plus it does have a vinegary smell to it. It is also known to clean water bodies. Imagine what we could achieve if all of us made this garbage enzyme at home! This bio enzyme is made from waste peels and costs next to nothing. It is completely organic and safe for your water supply so can be easily used for all your household cleaning needs. 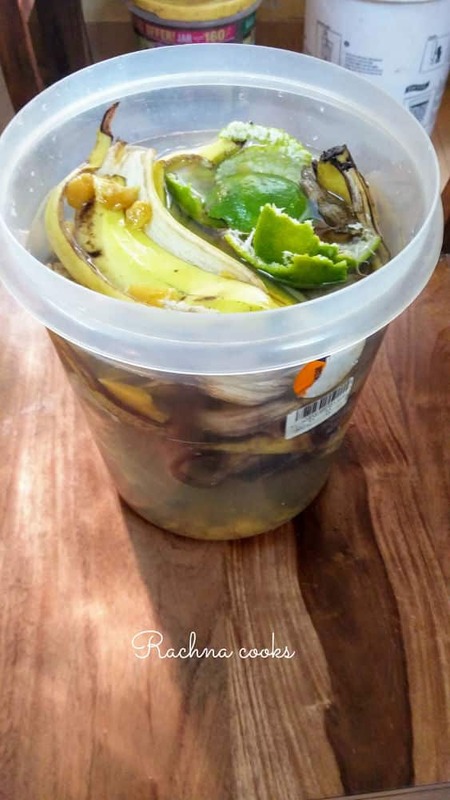 The peels can be composted after the vinegar is made and you can use this enzyme as a starter for your next batch and also in your composting bin to break down the wet waste faster. Amazing, isn’t it? Are you motivated enough to try this on your own? I had no idea that the peels we throw away without a second thought can be used so effectively. I’m going to try this too. I have a question: Since it has sugar/jaggery won’t it attract insects when it is being made and wouldn’t it smell? It actually doesn’t. But you have to keep the container tightly shut. I kept the container below my kitchen sink and had no issue of insects etc. Ok, that’s good to know. Thanks, Rachna. It sounds easy and doesn’t need much work. Thanks for sharing the process in such detail. Worth giving a try! Oh yes, it is very simple. Do let me know once you try it ? This is fantastic, Rachna! I’m really in awe of the effort you’ve put in to make this happen. Question: I have a closed apartment, so is there a way to store this in a place without the smell becoming overwhelming? I don’t have any outdoor space as such. The common area cannot be used for keeping our personal items. But am so tempted to try this out! ? Thank you, Shailaja. I kept it under my kitchen sink and it does not stink at all. Trust me on this. ? You can easily try it. It actually requires zero effort once you have made the initial solution except for letting out the gases daily. Using citrus peels makes the smell pretty decent. ? Okay now I am really tempted! Under the kitchen sink is definitely doable. Thanks again ? Yes do try it. Dagny suggested to add essential oils so I think I will do it to help with the vinegary smell. ? This sounds doable, and we could use it guilt free. I think I would like to try it. 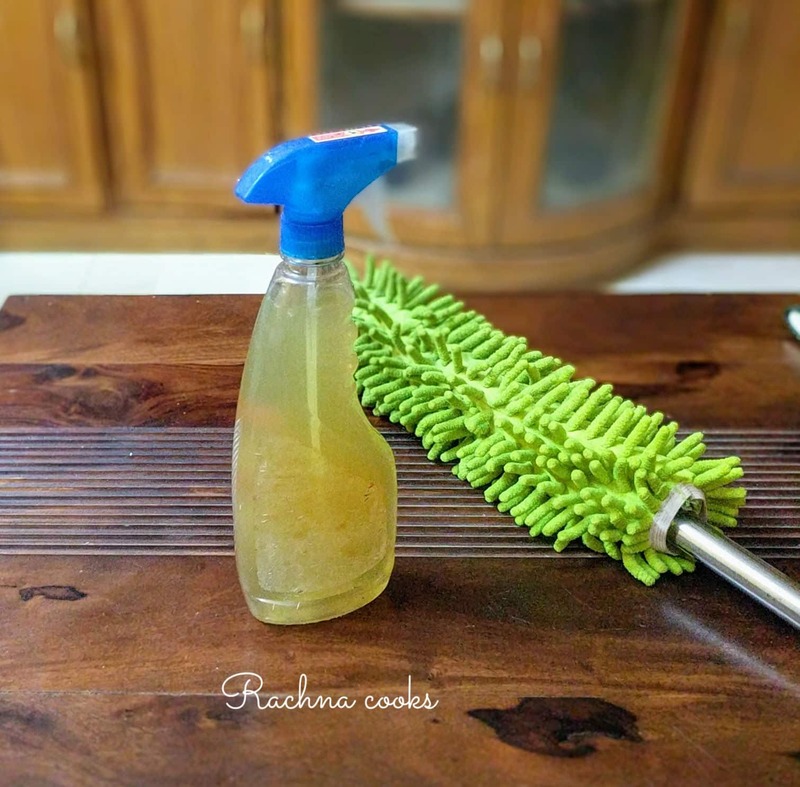 Thanks for sharing this eco-friendly cleaner recipe and your experience with us. Thanks Mayuri. My mind is buzzing with the multiple things that I am going to try with this. You are so cool. My only question would be to get that many peels to make it. Like I would like to collect peels and then do. Possible? Having said that, this is such an amazing effort. Kudos to you. That’s a very valid question, Parul. Like you, I also collected peels in an airtight container. What helps is if you get a kilo or two of oranges. Those peels don’t spoil. Also lemon peels. Keeps their proportion high because they have a good smell. I used banana peels too because we eat a lot of bananas. Those are neutral smelling. When you are trying this, collect all the peels within a week else they might start rotting. 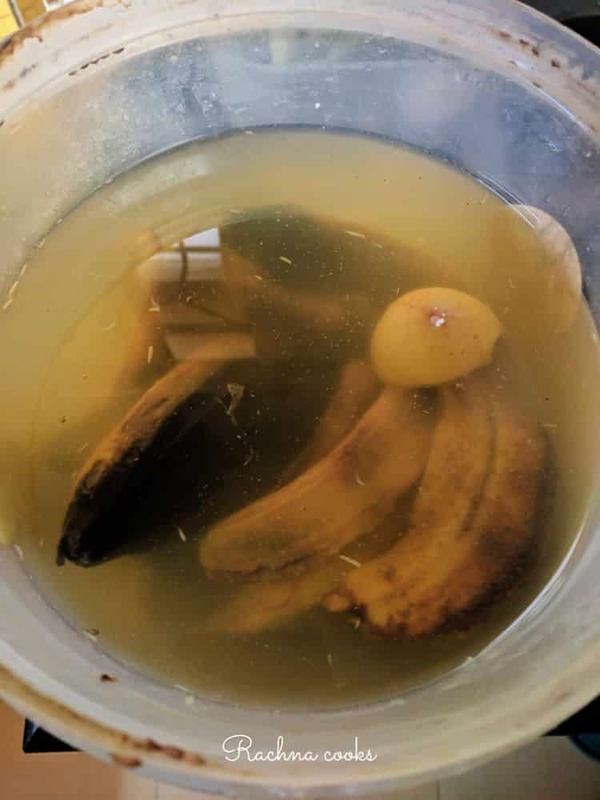 I am surprised to know banana peels could be used as cleaner. great discovery! WOW! I can’t believe you made this and patiently waited for 90 days too. Awesome. Any idea what jaggery or sugar does here? I’m just curious ? I’m going to collect peels for a while now, especially with so many fruits and vegetables at home these days. Thank you for such an easy and simple recipe for a cleaner. Another question. The gas you mentioned that needs to be released, does it stink? I have a crazy reaction to smells that cause me an instant migraine, hence the question. Also, what is the overall smell of the cleaner? Just vinegarish as you mentioned? Or it depends on the fruits used? It is basically anaerobic breakdown of sugars by bacteria that does fermentation of the organic matter by feeding on sugar. The result is acetic acid which is vinegar like cleaner. ? Citrus peels are the best as they smell good. So at least use some citrus peels. The gases released are CO2 and Hydrogen and sometimes methane, none of them have any smell. It’s just that they will build up pressure inside and hence need to be released regularly. Yes the overall smell is vinegary and citrusy in my case. Depending upon the peels used the colour and smell of the final product will vary. ? I am definitely going to try this! Looks too easy not to, especially when it’s so good for the environment. I have one question though – does this need to be at a particular temperature? Because usually such things require warm weather, and here in US the temperatures have already started dropping, so was curious. I am so happy that you will try this. Yes a cool, dry, dark place should do it. Under your kitchen sink is the best. 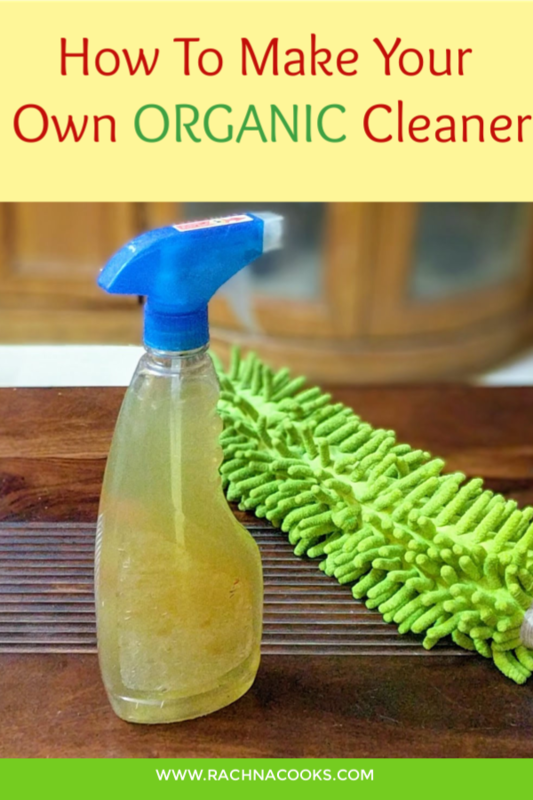 What a brilliant way to use peels to make your own organic cleaner. I am soo tempted to try this out.. I didn’t know I could make a cleaner this way! I’m all for natural alternatives, and reducing waste where possible. You can also use banana peels as a plant fertiliser. If you cut them up and soak them in a spray bottle full of water for a few days, you can then use the water as a plant feed. Another way to reduce your waste! Wow Rachna! I am definitely trying this and the Compost. I missed seeing this post as I was in crazy working phase from September to December.